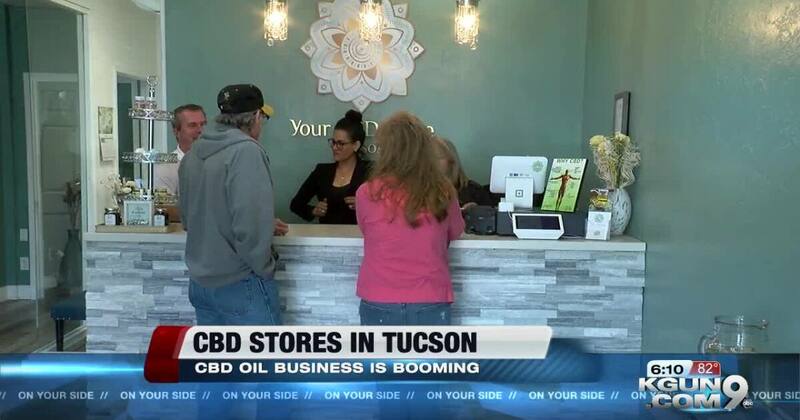 TUCSON, Ariz. — You may have noticed CBD stores opening around Tucson or the products being sold around town. Sales are soaring at those stores thanks to rumors of powerful health benefits. Owners of Your CBD Store say they are trying to combat the stoner stigma and say you don’t need a medical marijuana card to make a purchase. CBD has been touted as a remedy for pain, arthritis, anxiety and a host of other conditions. It’s even used in beauty products. Cannabidiol is a chemical compound found in both marijuana and hemp plants. Business is booming around the country including new stores opening up around Tucson. “So much we’ll be opening our third location soon northwest side up in Marana,” said Owner Brian Mildebrant. The 2018 US Farm Bill passed in December. Hemp is no longer a schedule 1 drug and CBD oil can be purchased without a medical marijuana card. Mildebrant says his products won’t get you high or in trouble at work. One customer said she no longer needs anxiety medication thanks to CBD. “Less stress, and less dependence on prescription drugs,” said Rose Powell. Mildebrant says he hopes the old stigma around hemp and marijuana won’t get in the way of people feeling better. While Mildebrant says his products have zero THC sources of CBD might have more. The Pima County Sheriff’s office says CBD is legal as long as the THC level does not pass the federal limit of .3%. The Food and Drug Administration can cite and fine companies that openly make claims that cbd can cure an ailment or disease.